Tall waterhemp (Amaranthus tuberculatus) is expanding its reach across Minnesota, and herbicide-resistant populations are becoming more commonplace. Most waterhemp populations have been resistant to ALS (Group-2) herbicides, such as Pursuit, for a while. In addition, glyphosate-resistant (Group-9) populations were first reported in 2007, and PPO-resistant (Group-14) populations were confirmed in southern Minnesota the past two growing seasons. Herbicides in Group-14 include Cobra, Flexstar and Spartan. To add to management challenges, some waterhemp populations have developed resistance to two or all three herbicide groups. In this situation, what herbicide control options are left? 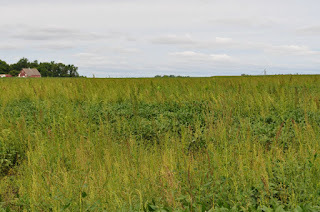 Once postemergence applications of ALS-, glyphosate- and PPO-herbicides have lost effectiveness against waterhemp, a farmer planting Roundup Ready soybeans would have no viable postemergence herbicide options left to control waterhemp. Switching to a LibertyLink or dicamba-tolerant soybean would provide postemergence control options, but late application or overuse of these systems is not a long-term solution either. As history has shown, over-reliance on any one herbicide over time can be a great way to select for resistance to that herbicide. The extended emergence pattern of waterhemp poses further challenges. Even when a residual herbicide is applied at planting, late-emerging waterhemp may not be controlled as the amount of herbicide remaining in the soil may be below the amount needed for effective control. The length of effective control is influenced by the herbicide applied and the application rate. Figure 1. Concept of layering soil residual herbicide (PRE/POST) to control waterhemp populations in soybean. To help address these challenges in controlling waterhemp, one strategy is to layer Group-15 herbicides, such as Dual, Outlook, and Warrant, or a Group-14 herbicide such as Valor preemergence followed by an additional Group-15 herbicide application about 30 days later (early POST). As illustrated in Figure 1, control from the preemergence application declines just as the July flush of waterhemp seedlings is beginning. The second, layered application extends seedling control through peak waterhemp emergence. How do Group-15 residual herbicides (Dual II Magnum®, Outlook®, and Warrant™) perform in a single preemergence treatment vs. a layered (two-pass) treatment comparison? What is the optimum time to make the layered application (20, 29, or 44 days after preemergence (at planting) application (DAP))? In waterhemp populations that are not PPO-resistant, how effective is layering multiple residual SOAs: soil applied Group-14 herbicide followed by a POST Group-15 herbicide? Layered applications of the three herbicides, Dual II Magnum, Outlook, and Warrant, provided significantly better waterhemp control than a single preemergence application (Table 1). 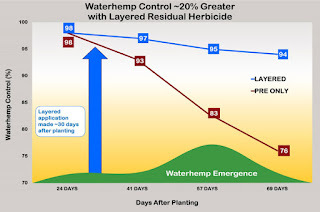 When averaged over two years, the layered approach maintained better waterhemp control throughout the season while control with the preemergence-only application declined significantly (Figure 2). By the end of the season, the difference in control between the two approaches was 20 percent. How does this look in the field? Photo 2 illustrates differences in weed control at two dates between a single preemergence application and layered applications of Outlook. Figure 2. Average control of layered (PRE/POST) residual herbicides compared to preemergence (PRE) application (2015-2016). Photo 2. Comparison of weed control in soybean with a single preemergence application of Outlook (left) and layered applications of Outlook (right). Top photos taken July 14, 2015. Bottom photos taken three weeks later on August 6, 2015. Table 1. Waterhemp control and soybean yield with residual herbicides applied either PRE only or layered PRE/POST at Rochester, MN. Layered application was made about 30 days after planting. 1FirstRate (cloransulam) (Group-2) was applied PRE to control other broadleaf weeds in all treatments. 2Soybeans harvested October 14, 2016. Yield is adjusted to 13% moisture. 3Rating date was September 26, 2016. This research demonstrated that waterhemp seedling emergence extended well beyond the control provided by a single preemergence application. In 2015, layered residual herbicide applications at planting and 30 days later provided significantly better control than a single application at planting. While the 30 DAP application was effective, we wanted to evaluate if there was a better time to make the second application. Figure 3. Comparison of a PRE Dual II Magnum application followed by three different POST Dual II Magnum application timings (20, 29, and 44 DAP) for waterhemp control in soybeans at Rochester, MN, 2016. In 2016, we expanded the study to look at three different application dates for the layered or second application. Dual II Magnum was applied 20, 29, and 44 days after planting (DAP). As seen in Figure 3, the optimum time was around 30 DAP. The 20 and 29 DAP treatments provided 92 to 98 percent season-long control with minimal waterhemp escapes, which was significantly better than the later application at 44 DAP, which resulted in escapes by the June 27 rating and 85 percent control. This corresponds with the herbicides' average half-life (∼30 days), when control begins to diminish. 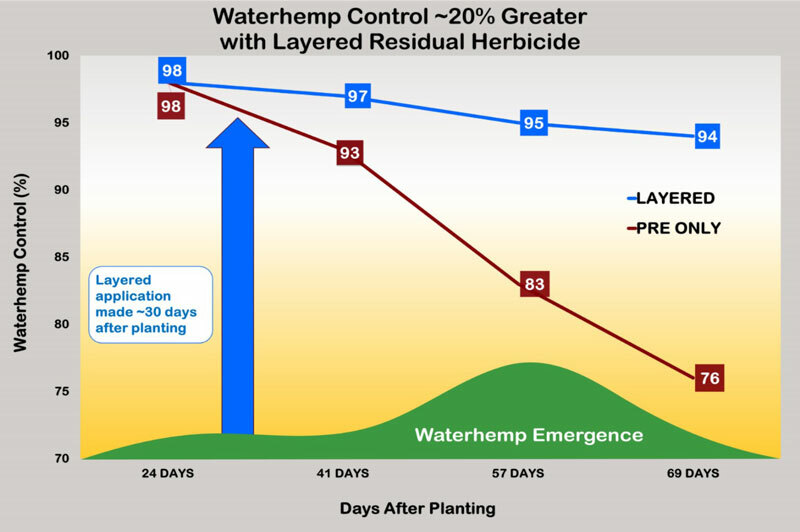 This shows that if the second residual application is delayed, a postemergence herbicide that controls emerged waterhemp and other weeds should be included. Figure 4. Comparison of common waterhemp control with layered (PRE/POST) applications of three Group-15 herbicides and layered (PRE/POST) Group-14 / Group-15 herbicides in soybeans, Rochester, 2016. In an effort to use multiple effective SOAs to control waterhemp populations, we evaluated the performance of layering Group-14 Valor® SX followed by Group-15 Dual II Magnum. When compared to the layered Group-15 herbicide programs, the Valor SX/Dual II Magnum provided excellent control (98%), which was similar to the layered Dual II Magnum (94%) and Outlook (95%) and better than the layered Warrant (91%) control (Figure 4). However, because populations of PPO-resistant waterhemp have been increasing, the effectiveness of a PRE Group-14 herbicide may be diminished and provide shorter duration of control. 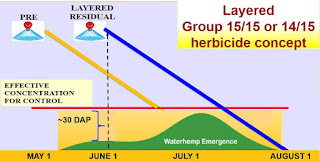 Layering an effective residual Group-15 herbicide postemergence would make this a more durable system. 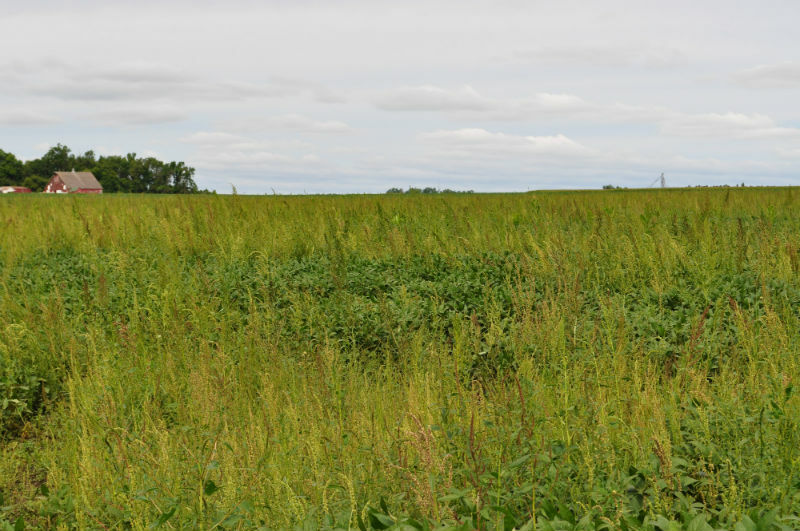 For the complete report, see Managing Waterhemp in Soybean with Layered Residual Herbicides - A Strategy for Controlling ALS and Glyphosate Resistant Waterhemp in Minnesota, 2015 and 2016. Results from 2015 are described in the Crop News article, Manage waterhemp in soybean with layered residual herbicides. Dual II Magnum® is a registered trademark of Syngenta. Outlook® is a registered trademark of BASF. Warrant™ is a trademark of Monsanto. Valor® SX is a registered trademark of Valent USA.